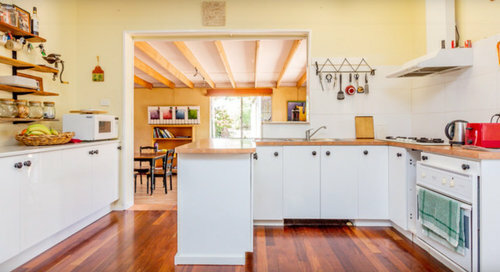 It is a 1960s style house, the floor plan is the garden facing West, the entrance is facing south. L shaped verandah wraps around the front. 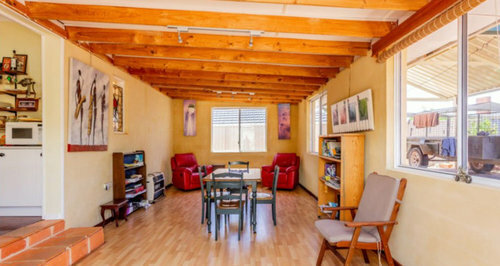 Entrance opens up to the small front living room with the kitchen space to the right, corridor straight ahead leading to two smallish rooms and a small central bathroom. The extension is a small, rectangle shaped room that can act as a small living room and study desk on the other end. 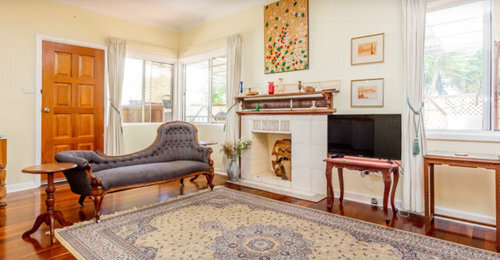 In the front living area, there is a fire place (not in use anymore). I was thinking putting french doors to the right of the fire place to open up to verandah and garden to help create illusion of space. I love the idea of French doors. Would you be able to block off that gap in the lounge wall? That would give a workable corner for furniture arrangements. What do you use the room for? 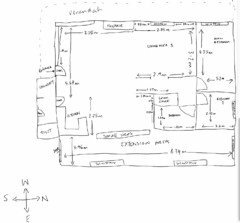 I hope the added notes with windows and dimensions clarify my rough sketch. Approximate dimensions at this stage as we have not moved in yet. Please note toilet is also laundry. 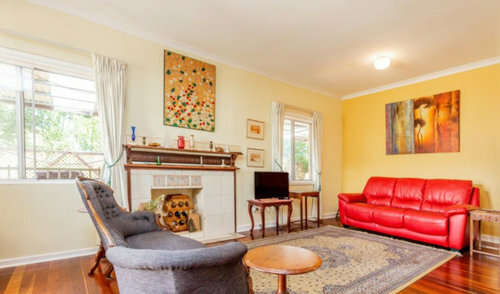 I have also added another photo so you can see that the gap in the lounge room (on the left in the photo) is actually a sliding door as it used to be a third bedroom. I love the idea of blocking that off to create a lounge space, and then french doors parallel. Thank you! 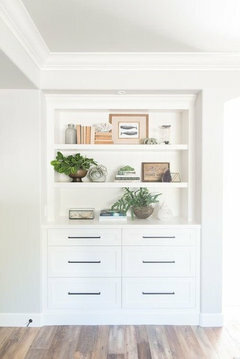 You’ll get some wonderful ideas here from our plan gurus but you may need to wait until you can confirm measurements. Eg the extended living room is def wider than two metres. It looks like a great project, good luck. Okay thank you Bigreader, in my excitement I have perhaps jumped the gun. I will confirm measurements and update shortly. Thanks for all your comments thus far! Here’s an inspiration pic. You could fill in the doorway with something like this. What an exciting project! I think double french doors to the verandah and garden would be lovely (and symmetrical). I have seen this done and it definitely brings the garden in. You could use the colour scheme from the garden for your living area...with the fireplace restored to working order, beautiful! The extension area appears to be facing north/east and would make a beautiful area for study/TV/plants! I also like the closing off solution as suggested by big reader. Lucky you! So much potential! Thank you so much, as I was feeling overwhelmed and doubtful of what we could do. Your comment is very reassuring! No suggestions to offer. Just wanted to say, I love your cottage! It is cute and has a lovely 'feel'. UPDATE! Specific measurements as sketched below. And anything else that you might think! A couple in early 30s. Small budget $5k, so looking for layout ideas for rooms and creative design ideas. For example, we already filled the gap in living room as suggested by bigreader - it looks amazing - thank you! I also replaced the black knobs in the kitchen cupboards with white knobs, which blend in with the cupboards and the whole space. Small, cheap, but effective. Climate: Mediterranean. 3.5km West to the beach. Curtain ideas? - Colour, textures for each room. We are painting all rooms a neutral white. Extension: Lounge area (L-shaped sofa, TV) at the North-East corner of room. 6 seat dining table in the middle. Maybe a study desk on the other side. 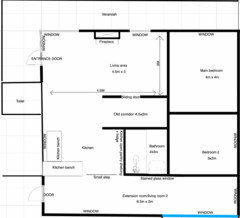 Long term plans: Do something with the bathroom and kitchen space. 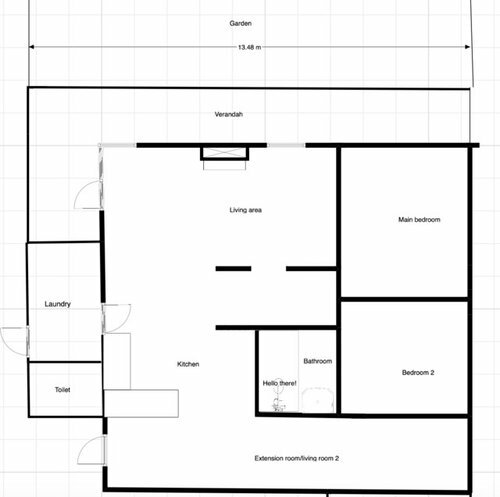 Need help with living room layout! !